In 1939 my grandfather visited Donington Park to see the greats of voiturette racing go head to head. He has captioned the photos as being the Empire Trophy 1939 with Siamese prince B. Bira as the winner. I suspect grandfather actually attended that year’s Nuffield Trophy, which Bira won in ERA R12B, nicknamed Hannuman. 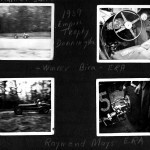 I find it so exciting that he actually got to see Mays and Bira racing the cars which continue to excite and thrill crowds, myself included, in historic racing today – and looking just as they did then. It is magical to imagine him enjoying the nose of Castrol R and rejoicing in the rasp of that Riley-derived straight 6, just as I have done so many times in recent years. If only he was still around to share the experience with me. 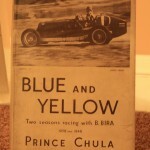 There is a fascinating account of the race in Prince Chula’s book Blue and Yellow, detailing the emotions of watching your driver at the head of a fine field. 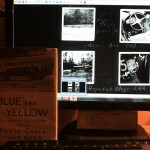 The cover photo on the book looks remarkably similar to my grandfather’s and I do wonder whether it was taken during the same race. Sadly the cover illustration is not listed in the book.